As an ex-Captain, I have frontline experience of the benefits of conducting regular onboard technology upgrades. Far from the cynical view that all integrators are motivated to upsell, captains and owners should understand that keeping pace with fast-moving technological advances is the only way to ensure your onboard system delivers on all fronts. ‘If it ain’t broke, don’t fix it’ is a popular adage often bandied around, and in some cases rings true (I would never advise a client to upgrade if there is no requirement to do so). However, ignoring too many incremental improvements can and will over time result in a once legacy system becoming something of a tired dinosaur. It’s treading a thin line around these types of delicate nuances that can present the trickiest of problems for refit integrators. That being said, it is rarely necessary to simply remove everything on board and replace with new. At FMS we try our hardest to re-use or recycle existing equipment and hardware wherever possible. Our recent refit of Oceanco’s 59.1m motor yacht HELIOS is a prime example, whereby we repurposed the Kaleidescape video on-demand-systems from the owner’s areas and placed them in the crew quarters at very little additional cost. We also re-used existing audio speakers and TV lifts. Small details like this not only present a financial saving for the owner, but help us to work with sustainability at the fore. Of course, we do always try to future proof our systems, as well. The lack of a crystal ball that informs us on what future technologies will provide is regrettable, but by using respected and proven original equipment manufacturers who build reliable and tested equipment should help onboard systems to stand the test of time. "The key to a successful and robust systems upgrade, in my opinion, is for yachts and shipyards to engage early on with AVIT integrators." The key to a successful and robust systems upgrade, in my opinion, is for yachts and shipyards to engage early on with AVIT integrators. The most important element is the pre-sales health check and technology review meeting on board, when we have the opportunity to ascertain the current system’s limitations, the state of the existing foundations (such as cabling, racks, etc.) and whether the current architecture is suitable for a technologically advanced system to be installed. It’s far better to have a considered and planned ‘spend now, save in the future’ approach, than a rushed ‘save now, spend far more in the near future’ scenario. Too often, we see standard off-the-shelf software from the consumer-electronics market being installed on board yachts in an effort to save time and money. 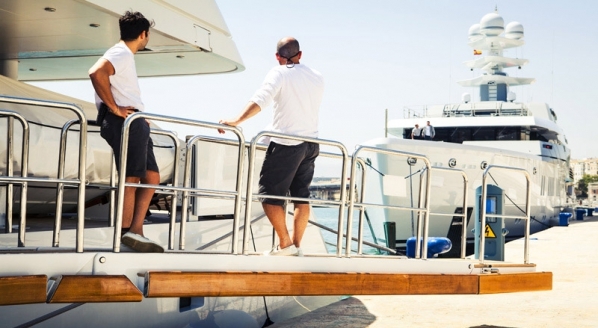 While a fully tailored yacht system with bespoke programming will inevitably cost more, it will undoubtedly save the owner money in the long-term. Apart from simply being more robust under daily operations, only a fully-custom system can be properly integrated into an existing system. It’s imperative too that the integrator carrying out the works understands the compatibility of new technology with old. This can all be resolved with a detailed survey, good system design and skilled engineers who are experienced in this type of challenging work. First and foremost, the most important question that we need to ask is ‘What do the owner, charter guests, captain, engineers and crew not like about the current system?’. No refit will ever be successful if we don’t fully understand what the client wants, so how can it be improved and what is the dream scenario? On occasion reality bites, and we need to manage expectations about what is and isn’t (yet) achievable, but to avoid disappointment, it’s imperative that we understand what is being asked of both us and the available technology. "In terms of refit integration itself the most crucial area is time management." In terms of refit integration itself the most crucial area is time management. Timelines are highly compressed on a refit, far more than any new build project, and you have to work around a yacht’s structure and installations. it is imperative, therefore, to plan refits with military precision. We need to know when the yacht is arriving, whether there are any non-compatible works being carried out simultaneously, and what the departure date is. Reliance on third parties to provide key elements for our works on time and to the required specification can be testing. Having sufficient time to complete all our works, conduct the vitally important commissioning and soak testing, and prove that the systems installed are fully functional over a prolonged period of time during operations is non-negotiable. What happens if there is a total electrical failure when the yacht’s generators fail? This is an essential test for all onboard systems, but is rarely undertaken after a period of refit/maintenance. It’s also necessary to try and remember the little things. My experience as a Captain means I totally understand how a yacht operates internally, and how crew must conduct themselves. I believe that anyone carrying out works on board should operate within the same perimeters. Clean up after yourself, remove your rubbish from the yacht at the end of the day, safeguard the decks by not putting tools down on unprotected surfaces, be mindful of maritime and shipyard health and safety rules at all times, and have respect for the environment. It’s not hard, and it makes a big difference. Refits (or upgrade periods as we prefer to call them at FMS) are certainly both a challenge and balancing act, but with a flexible approach and above all prior preparation and teamwork, they can deliver a quantum experience change for an owner between cruising seasons.